The stiffness of a panel is proportional to its thickness. 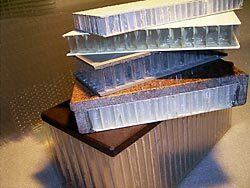 Core materials in panels are used to increase stiffness while adding very little weight. Hopro Honeycomb is a synthetic core material that accomplishes this and is moisture-resistant as well. Hopro Honeycomb is the ideal material for use in products which need to be strong and lightweight at the same time. Hopro Honeycomb provides the ideal solution, particularly for products which must also be moisture-resistant. Hopro Honeycomb is therefore the material of choice for furniture, doors, cupboards and countertops in kitchens, bathrooms or other areas which need to be disinfected. Due to its specific characteristics, Hopro Honeycomb can also be used in the foodstuffs industry. Hopro Honeycomb can be used in all sectors in which alternative honeycomb materials are generally used. But Hopro Honeycomb has additional unique characteristics of its own (including the combination of moisture-resistance, minimal weight and strength), which allow it to be used in a variety of additional applications. We are used to brainstorming with our clients and providing input with regard to (new) possibilities for using our range of materials to their benefit, and would be more than happy to assist you with practical (e.g. test pieces) as well as theoretical advice. 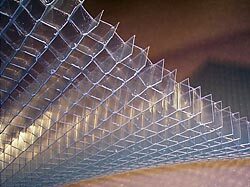 Hopro Honeycomb is a sheet material which is manufactured via a mechanical 'weaving and laminating' process from foil material (ABS or Polypropyleen). The pattern of holes (circa 12 mm) in between the vertical sections of foil reduce the weight of Hopro Honeycomb to a minimum while at the same time providing a high degree of stiffness perpendicular to the foil. The holes in Hopro Honeycomb resemble square shapes rather than round or hexagonal ones. Hopro Honeycomb can be covered with an additional skin on one or both sides (e.g. polyester or HPL). The result is a very stiff construction which is able to withstand very large loads. The foil thickness influences the load resistance. The foil thickness and the material used for the outer skin determine the stiffness. If no outer skin is present, the honeycomb structure has a certain degree of flexibility, depending on the foil thickness, and the panel can be bent into the desired shape. Once the skin is layered over the honeycomb, the shape becomes stiff.